Did you know there are approximately 320 million monthly active users on the Twitter platform? While some people use the service to converse with friends, follow celebrities, and kill time, others have another idea in mind: using Twitter to generate business. With Twitter advertising revenue reaching $513 million in Q3 2015, a 60 percent year-over-year increase, it’s easy to see that others are already using the platform to reach potential customers. But here is the real question: will you follow suit? When you come to the conclusion that Twitter advertising is a strategy to consider, it doesn’t mean you should start slinging money around. And it definitely doesn’t mean you are guaranteed to generate immediate results. 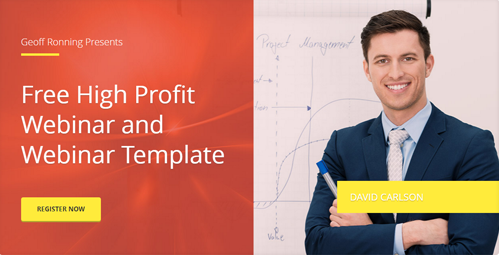 Your primary goal is to generate high quality, low cost leads that convert into new business. 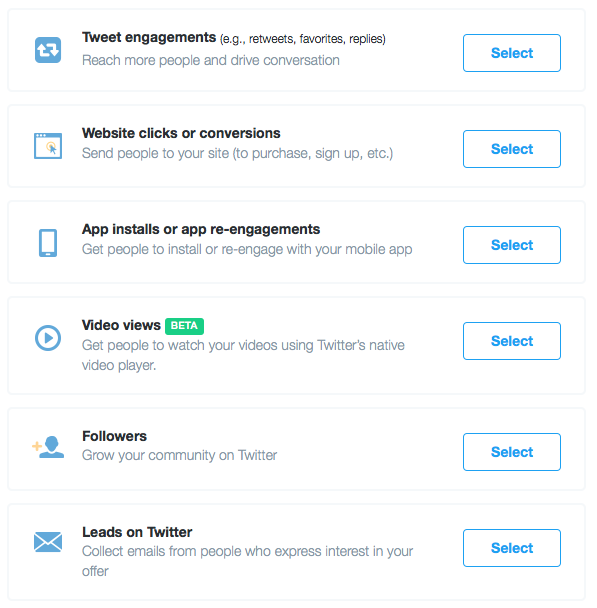 Doing so starts with knowing the ins and outs of the Twitter advertising system. In this article, we’ll examine the many types of ads, how to target the right audience, ways to save money, tracking tips, and much more. Let’s get started. Once you sign into your account and navigate to the advertising page, it’s time to take the first step. It is here that you will select a campaign objective. This is one of the primary benefits of Twitter advertising. There is more than one objective, meaning that you can implement a strategy that best positions your business for success. Maybe you are interested in nothing more than driving conversations at this point. Or maybe you want to send people to your website in hopes of making sales or growing your email list. Regardless of your objective, one of these six options is likely to suit your strategy and goals. This is a three step process, all of which you have control over. 1. Create what your audience sees. This will make or break your campaign, so be sure to put the appropriate time into selecting your creative. When somebody clicks on the image, they will land on your website. This is why the image needs to be attractive and appealing. 2. Know where it will appear. With the ability to target specific users, you know that your ad will be displayed to your target audience. Users will see your ads in their search results and timelines. 3. You are only charged for website link clicks. You don’t get charged just because somebody sees your ad. You are only charged for clicks to your website. To this point, you haven’t taken any major steps. You’ve learned more about your advertising options and how the process works. In the next four steps, you begin to close in on your first active campaign. Name your campaign something you will remember, especially if you plan on running more than one at the same time. For beginners, it makes most sense to set start and end dates. This protects against overspending. Once you have a campaign in place that is generating a positive return on investment, you will want to consider running it continuously. Whether or not you select locations is dependent on your campaign and business type. Some companies only want to connect with local prospects, while others have a global audience. You now have your filters in place. It’s time to make a big decision: how much money are you willing to spend on Twitter advertising? Step 3 is arguably the most important, as this will go a long way in determining your success and return on investment (either positive or negative). First things first, set a daily maximum budget. This allows you to put a cap on the amount you spend each day. If a daily budget isn’t right for you, consider using the total budget option. This allows the campaign to run until your maximum budget has been reached. At that point, your campaign shuts down until you reactivate it. Automatic: Your bid will be optimized to get the best results at the lowest price (within your budget). Target: provide a target cost for each click. From there, Twitter optimizes your bids to achieve your average cost, which typically falls within 20% of your target. 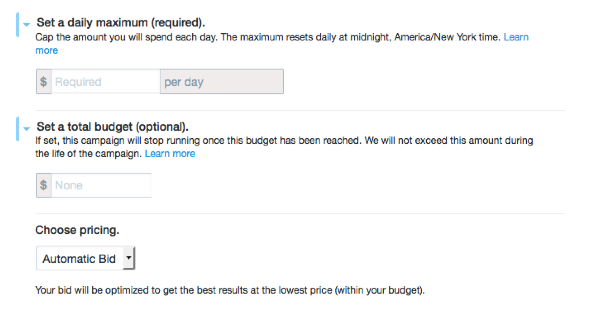 Maximum bid: tell Twitter the maximum you are willing to pay per link, and the platform will make sure you don’t exceed this number. In most cases, you will end up paying less. Without a high converting creative you can’t expect to make much progress. This step deserves plenty of time and attention, as well as constant tweaks to determine what works best. So, while you don’t have to add this information, it would be in your best interest. Your other option is to select an existing tweet. 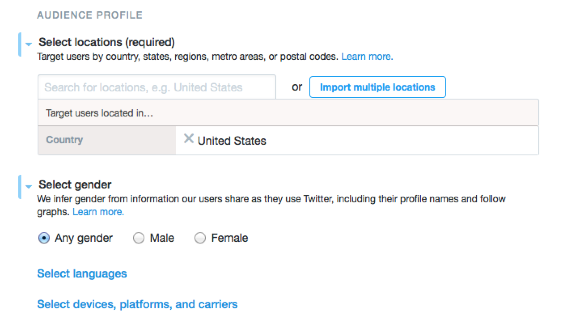 With this, you are asked to select three tweets to promote in your campaign. Fresh content is typically more engaging, but if you have a tweet that has performed well in the past, you may want to use it to your advantage in the future. Believe it or not, you’ve reached the end of the road. Your campaign has been created and it’s time to make payment. All you have to do is add a payment method and your campaign is ready to go live. The short answer is yes. Twitter makes it extremely easy to use its advertising platform. The long answer, however, is no. And here is the reason why: you can’t throw together just any ad and expect it to generate results. Here are three additional things you can do to achieve greater success. The question of what is and is not working is one you need to answer. This is why creating a conversion tracking tag is extremely important. Select the create a new website tag option. Choose the type of conversion you want to implement: site visit, purchase, sign up, download, or custom. Set the time frame for actions to be credited to Twitter. Save the tag and generate the code snippet. Insert the code snippet on your landing page or website. This allows you to track visitors who convert. Twitter provides advertisers with these types of simple and powerful solutions, as they help you generate higher quality, lower cost leads. Images are required to be a minimum of 800 px wide. With a recommended 4:1 aspect ratio, the best image sizes are 1,200 px X 300 px or 800 px X 200 px. Choose your title carefully, as this is the first thing people will see (it sits above the image). Use call to action words, such as: join, subscribe, and sign up. A short and sweet description. 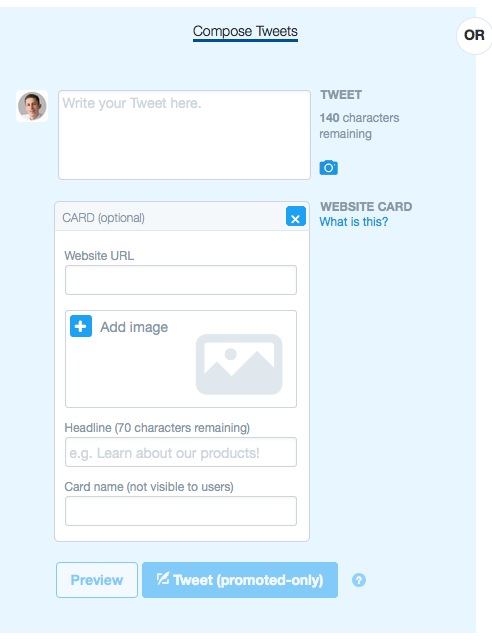 When somebody clicks on your lead card, the tweet will expand. This is when your description is provided. Are you giving the user a short rundown of what you are offering? Link to your webpage. Once a user submits information, they are presented with a link to a webpage that provides more details on your offer. Maybe you have one lead generation card. Or maybe you have several of these. You can run these simultaneously, allowing you to determine which one has the highest conversion rate. For those who don’t want to get involved with the deep depths of Twitter advertising, promoted tweets are a good start. This is a form of advertising, but it doesn’t take as much time, money, or knowledge to get started. The top of search result pages. Promoted trends pages when a hashtag is used. On a person’s home timeline. On a brand’s profile page. Just the same as any type of Twitter advertising, start slow with promoted tweets. As you get your feet wet, you will begin to learn what generates results, what doesn’t, and how to keep your budget in check. With Twitter’s share of the US digital display market on the rise, you can expect to see more advertisements on this social platform in the months and years to come. With this guide on your side, you are now in better position to generate high quality, low cost leads. Do you have any other advice to add? Have you achieved success with Twitter advertising in the past?